When readily available containers do not come in the desired form factor, 3D-printing can be quite useful. 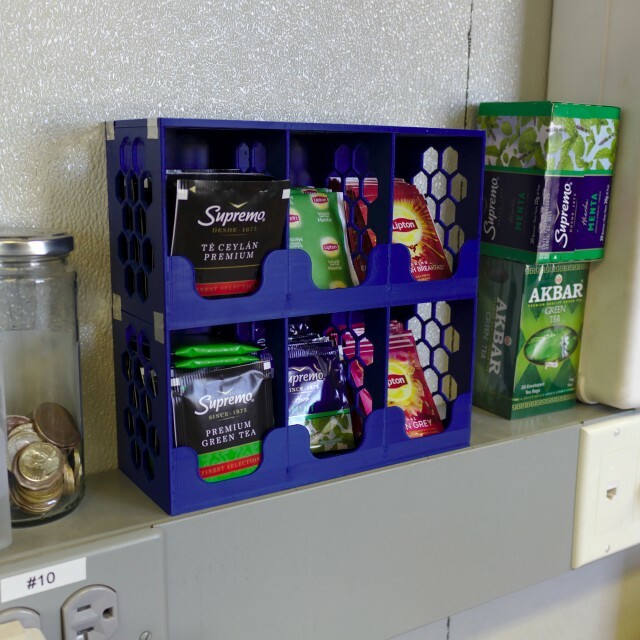 In this case, I wanted a tea bag holder that fit on a small ledge, allowed the tea bag labels to be read, and allowed the tea bags to be easily removed. Although there are some similar products available commercially that would fit the space, they either seemed a bit flimsy or looked to be a tight fit around the tea bags, which would make them more difficult to remove. Thus, I designed and 3D-printed a modular holder that can be stacked. The holder was printed out of PLA, and the design files are available. Earlier this year, I released a color cycle picker that enforces a minimum perceptual distance between colors, including color vision deficiency simulations, with the goal of creating a better color cycle to replace the “category 10” color palette used by default in Matplotlib, along with other data visualization packages. While the picker works well for what it was designed for—allowing a user to create a color cycle—it requires user intervention to create color sets or cycles.1 The basic technique used—performing color vision deficiency simulations2 for various types of deficiencies and enforcing a minimum perceptual difference for the simulated colors using the CAM02-UCS3 perceptually uniform color space (where each type of deficiency is treated separately) and a minimum lightness distance (for grayscale)—is still valid for the random generation of color sets; it just needs to be extended to randomly sample the color space. Fused filament fabrication (FFF) 3D printers are good for many things,1 but production of sharp points is not among those strengths. Thus, the traditional structure of millimeter wave absorbers—a periodic array of square pyramids—is poorly suited for production via FFF printers. Millimeter wave absorbers serve a crucial role in Cosmic Microwave Background (CMB) telescopes by terminating stray light, which is necessary for reducing systematic errors. Not only are the points difficult to produce; they’re also fragile, since a print is generally weakest along its layer lines. Thus, a new geometry was needed, as is detailed in my paper titled A 3D-printed broadband millimeter wave absorber. 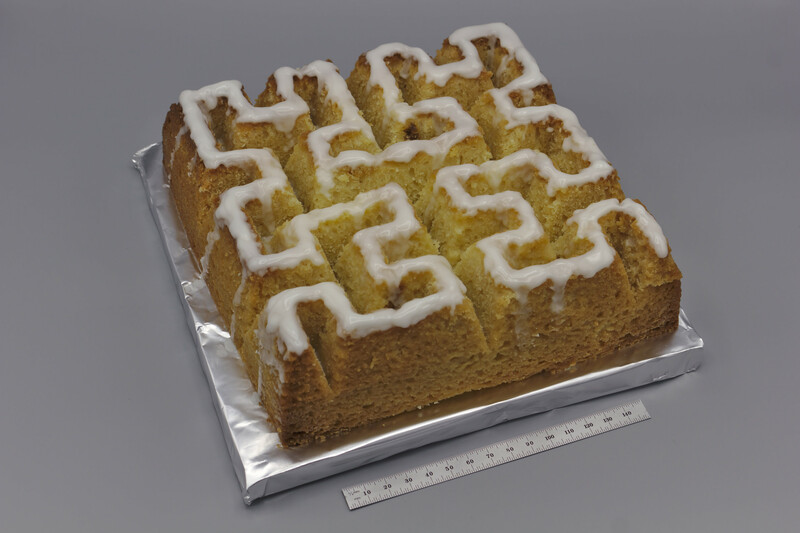 Space-filling curves such as the Hilbert curve completely fill the unit square. Furthermore, the Hilbert curve can be described by a sequence of physically realizable geometric approximations. Tracing a wedge along such an approximation creates a geometry with similar optical properties as a pyramidal array but with enhanced mechanical robustness. 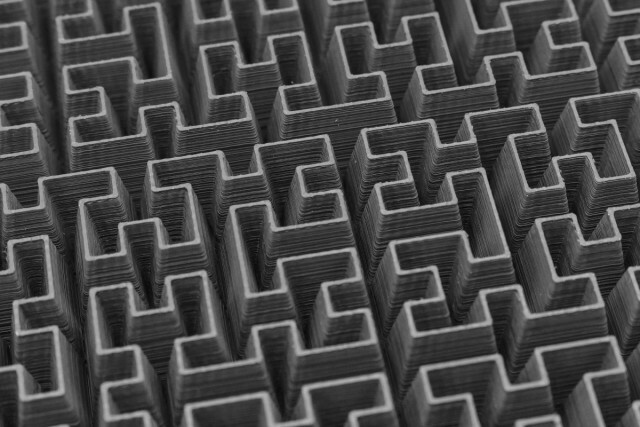 Importantly, this geometry can be printed without repeatedly starting and stopping extrusion, making it well suited for FFF printers.